The Yunus Emre Institute will organize a certificate program for students benefitting from Turkey Scholarships provided by the Presidency for Turks Abroad and Related Communities. 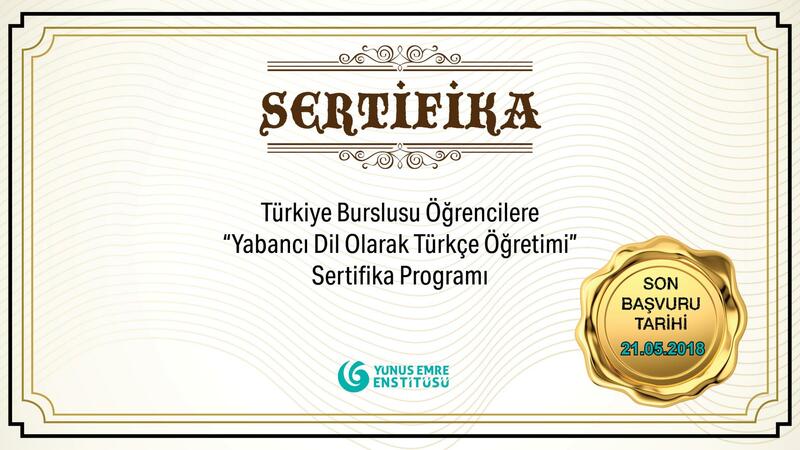 The program will be open for participation by those people who have graduated from the graduate-level departments of Turkish Language and Literature, Turkish Language and Literature Education, Turkology, (Contemporary) Turkish Dialects and Turkish Education or by those people who are continuing or have completed post graduate or doctoral studies in those departments. The participants will attend theoretical and practical training every day between 09.00-18.00 on weekdays. During the program, internship practices will be carried out in the mornings at Hacettepe University’s Turkish Teaching Center (TÖMER) while in the afternoons seminars will be given by branch experts about “Turkish Teaching as a Foreign Language.” In addition, the participants will take part in material designing exercises for Turkish instruction for foreigners with four-language talents. * Participants are required to attend the program. * No fees will be charged for participation. * Lodging and boarding expenses will be met by the YEE. Submission of original enrolment documents: 24 May 2017 Thursday, 15.00 O’clock.